Is Disneyland Paris on your wish list? My kids were thrilled when we told them we were adding a day in Disneyland Paris to our Paris itinerary. They liked visiting well-known Paris destinations like the Eiffel Tower, Louvre, Notre Dame and Versailles, but in the end, Disneyland Paris was their favorite day of the trip. For families like ours who know their way around Disneyland or Walt Disney World, Disneyland Paris feels fresh and familiar at the same time. It has several of our favorite rides from Disney Parks in the USA, and a few attractions that you can only find in Disneyland Paris. It’s a must for Disney fans, and a fun place to visit with kids. With so many great things to do in Paris, we carved out just one day for Disneyland Paris, and we had a great time. Here are my tips for making your day at Disneyland Paris the best it can be. Yes and no. Disneyland Paris has two parks – Disneyland Paris and Walt Disney Studios Park – but neither is as large as Disneyland and California Adventure in the USA. It’s not even close to Walt Disney World. You can hit the highlights of both parks at Disneyland Paris in one day and feel satisfied. That said, one day is not enough to thoroughly visit both parks. There were several attractions that we were sad to miss because we ran out of time and energy. If Disneyland Paris is the main reason for your visit to Paris, I recommend 2-3 days in the parks. If it’s one of many wonderful places you’re planning to visit in Paris, then one day at Disneyland Paris is enough. You have the option of purchasing a 1-Park ticket or 2-Park ticket if you visit for just one day. You’ll save more than $20 per ticket if you choose one park and skip the other. Sticking with one park is arguably the best option for your time and money. However, you’ll miss major attractions that are unique to Disneyland Paris. If you choose one park, I’d pick Disneyland over Walt Disney Studios. It’s bigger, and you’ll get the classic Disneyland experience plus fresh takes on favorite attractions like Pirates of the Caribbean, Big Thunder Mountain Railroad and Sleeping Beauty Castle. You’ll find a few unique attractions as well. We did both parks in one day and I don’t regret it. Families with lots of energy and no mobility limitations should be able to walk all over both parks with little trouble. Families who want to cover less ground at a slower pace, and dig deeper into one park for less money may prefer the 1-Park option. Disneyland Paris is located about 20 miles/40 km outside of Paris. That’s no small distance, but you can easily get there on public transportation. For one day in Disneyland Paris, it made sense for us to stay at our AirBnB in Paris, and take the train. There are many Disney hotels and partner hotels near Disneyland Paris to choose from. If you plan to visit Disneyland Paris for more than one day, I would definitely consider the Disney hotels or other local hotels. Click the button to check rates and read reviews for hotels at or near Disneyland Paris at TripAdvisor.com. Public transportation was the best option for my family. Use Google Maps, the Paris RATP app, or your paper map to find your nearest connection to the RER A line. RER trains work the same way as the Metro and use the same stations, but travel farther outside Paris. RER A Trains arrive at Disneyland Paris about every 20 minutes. Take RER A to Marne-la-Vallee. On the map and in stations, it will be marked with Disney mouse ears and “Parcs Disneyland,” so it’s easy to identify. Disneyland Paris is just a few steps from the station. The trip should take you about 45-60 minutes each way from Paris. If you purchase a Paris Visite Pass, rather than a single round trip ticket, make sure that it includes all 5 Zones for your travel to Disneyland Paris. There are other ways to get to Disneyland Paris, including tours, Eurostar, Uber and renting a car. You can even add shuttle service from central Paris to your ticket on the official Disneyland Paris website. For many families, public transportation is an easy and flexible option. I received two media tickets and purchased two more tickets for our day in Disneyland Paris. I purchased our tickets on the Disneyland Paris website and printed them at home. We saved about $30 USD per ticket, compared with the gate price, by purchasing online in advance. The other advantage of purchasing and printing tickets from the official site in advance is that you can take them straight to the gate. You may find Disneyland Paris tickets for a good price from reputable brands like Viator and Expedia. Just be aware that if it’s a voucher instead of a ticket, you’ll spend time in line at Guest Services before you can enter the park. Use the calendar on the Disneyland Paris ticket page to pick a day when crowds are expected to be light. Not only will you save time in line, you’ll save money on single-day tickets too. Disneyland Paris has a three-tier demand pricing system, meaning that single-day tickets are more expensive on days that the park is expected to be more popular. Weekends and holiday season crowds tend to be heavier. Weekday crowds tend to be lighter. We bought tickets for a Tuesday in mid-June and paid the lowest price. I would not call Disneyland Paris uncrowded on the day we were there. However, it was significantly less crowded than that same day would have been at Disneyland or Walt Disney World. Disneyland Paris has an official app, and it’s handy for checking wait times, show schedules, finding bathrooms, and much more. It saved us from trekking across the park to find that the ride we wanted was temporarily closed. Disneyland Paris typically opens at 10:00 AM. I’ve read that you can actually get in at 9:30, so it pays to arrive early. That was our plan, but we didn’t arrive quite as early as we hoped. We left our apartment at 8:00 AM, expecting to arrive around 9:00 AM. We barely missed our train. Weather and strikes added time to our wait, which was frustrating. We arrived at Disneyland Paris a little before 10:00, and then spent time at Guest Services and City Hall to pick up my media passes. After all that, we were really ready to ride. Apparently, transportation strikes happen fairly regularly in Paris. The good news is that they don’t completely shut down the trains, they generally just reduce the frequency. Not all trains are affected. They schedule strikes in advance so you can plan around them. Just Google “Paris Strike Schedule” to see if your trip will be affected. 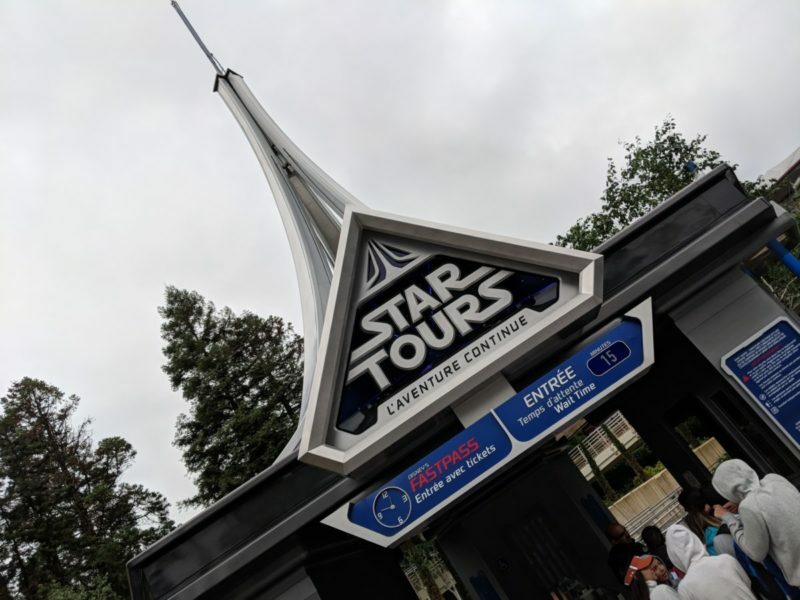 Disneyland Paris has FASTPASS and Single Rider lines at many of its most popular rides, and they are a good way to make the most of your limited time at Disneyland Paris. Look for kiosks near rides with FASTPASS lines. Scan your ticket and take the FASTPASS. Then return later in the time frame on your FASTPASS ticket. You’ll cut your wait to about 15 minutes in line. Single Rider lines are great for families with older kids who would rather ride fast than ride together. You’ll fill empty seats and ride with other groups, but you’ll probably get through the line a lot faster. Baby Switch is a good option for families with children who are too young for some attractions. Parents take turns riding, but wait in line together just once. Disneyland Paris will allow you to bring a few sandwiches and snacks into the park. We brought a few provisions in a day pack and then nibbled our lunch on the go, without losing any ride time during our first hours in the park. Disneyland Paris is filled with restaurants. Character Dining and meal plans are available as well. I didn’t notice any of the “must-have” snacks like Dole Whip, corn dogs and others that I’m used to at Disneyland in California. However, with just one day at Disneyland Paris, sampling all the eateries was low on my list of priorities. We ate dinner at the quick and relatively inexpensive Restaurant en Coulisse in Walt Disney Studios. They serve fairly typical theme park burgers and fries, and we were glad to find a veggie burger on the menu for my vegetarian son. There is a picnic area just outside the parks, and many more restaurants in Disney Village. These include familiar names like McDonald’s, Starbucks, Five Guys, Rainforest Cafe and many more. I’d save these for the very end of your day, or for another trip, since walking out to Disney Village then back into the parks will kill a lot of time if you only have one day at Disneyland Paris. Want more tips for visiting Disneyland Paris? Some Disneyland Paris rides are Disney classics, while others can be found only here. Click the blue button to read about our favorite rides at Disneyland Paris. One day at Disneyland Paris isn’t much time, but it is enough to make great family memories. I hope these tips will help you make the most of your visit. Happy travels! Disclosure: Disneyland Paris provided me with two complimentary passes and four VIP FASTPASSes for the purpose of review. I purchased two additional passes. All opinions are my own.